That makes no sense. WTF is a "B738 MAX" ? American air safety experts are trying to persuade their Ethiopian counterparts not to send the flight data to crash investigators in London, The Wall Street Journal reported. Instead, they want it examined by the National Transportation Safety Board in the United States. That's bordering on all-out National panic of losing their big aircraft manufacturer. Wouldn't have expected the Panic going that far and reaching formerly largely independent Organisations (NTSB) in the US. Perhaps this is the day that we, as an aviation resource site, have caused the global grounding of an aircraft type. I believe that the discussion that was/is going on here, and the raised concerns by some very knowledgeable experts (between some questionable commenters) has provided the world the leverage that was necessary. Sometimes it is better to be prudent. Maybe this is it. I am looking forward to the FAA “new evidence” that they mentioned. I would suggest that he got wind of the FAAs intentions after they received some data and announced it just before them. Hans - your patience is amazing. You are correct about the relationship between 737MAX engines and need for MCAS. It has nothing to do with the thrust pitching moment!!! There is a cert requirement that as AOA increases, the nose up pilot command required must not decrease. This is demonstrated at fixed thrust levels so there is no change in thrust pitching moment. The 737MAX issue here that gives rise to the need for MCAS is that as AOA increases the lift provided by the engine cowling that is so large and mounted so far forward of the wing causes a nose up pitching moment that results is a decrease in the column pull needed to maintain a steady positive AOA rate. That characteristic is not compliant with the requirements. MCAS comes active during this maneuver putting in nose down stabilizer that must be countered by the column. The net effect of engine cowling lift and MCAS nose down stabilizer as AOA increases is that the column needed to complete the maneuver does not decrease part way through the range of AOA for which characteristics must be demonstrated. 737MAX without MCAS fails the cert demo. 737MAX with MCAS passes the cert demo. 2. So, by the time you run through checklist, source the problem and stop the MCAS from further inputs by flicking the Stab trim cutout, the stab is already at X° nose down. 4. Additional engine power may already have been applied, but, if not, you do so now as you need some height, especially with advancing terrain and the loss of altitude that you'd suffered. 6. You think you have the problem somewhat under control compared to the situation you were in a minute ago. You've now been able to climb and seem to have relatively stable manual control. 7. Now you're at Y feet, (still with X° nose down stab trim) with an increased airspeed of Z, up until now has been controllable due to your elevator inputs being assisted by thrust moment and engine aerodynamics, but, at this new increased airspeed and increased altitude the yoke is becoming even more difficult to keep holding back. The stab is still in the same X° nose down it was when you switched the cut-outs, and up until now you mightn't have thought about it because you'd disabled it- in accordance with the checklist. 9. Once you level off, or even before then, with that stab STILL at X° nose down (now with a much higher airspeed component) there's only one place you're going. Once this vertical direction change has momentum there's now no chance, no elevators in the world are going to help you. Look at the memory item for stab runaway- i.e.- not told to manually wind back trim wheel, the instruction is to "grab and hold". All this could be caused by one errant sensor? Madness that it was certified. Last edited by positiverate20; 13th Mar 2019 at 22:20. 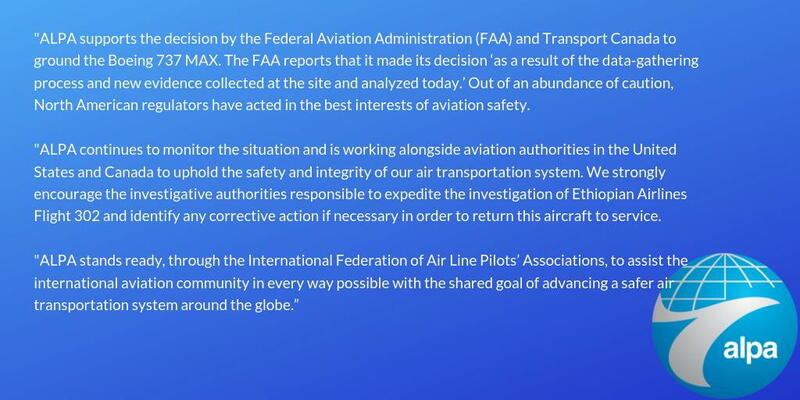 Speaking with reporters on a conference call, acting FAA Administrator Daniel Elwell said the grounding of the 737 Max 8 and 9 will remain in effect pending new information including from the flight data recorder and voice recorder. “Since this accident occurred we were resolute that we would not take action until we had data,” Elwell said. “That data coalesced today.” Elwell said the new data was "added fidelity -- missing pieces that we did not have prior to today." It aligned the Ethiopian flight data to the Lion Air incident. Elwell declined to guess how long the grounding would last but he said he hoped to keep it "as short as possible." “I can’t and I don’t want to hazard a guess as to how long. My hope is that the FAA, the carriers, the manufacturer, that all parties will work very hard to make this grounding as short as possible so that these airplanes can get back up into the sky," he said. Those airlines that have ordered the 737 MAX versions, can they just cancel their orders, or are they stuck with them probably with a 'No get out cause'?? It looks like ferry permits will be issued to move the aircraft for maintenance, storage or modification. Is it is true that ET are sending the FDR and CVR to Europe instead of the USA ? yeah, what's this new evidence? what do we know today that we didn't know Monday? They probably confirmed that the aircraft has had to come down in a near vertical nose down attitude, similar to the Lion air case. At some point the various regulatory agencies will need to figure it out. FAA needs to require Boeing to remove this "speed bump." That some alert and competent pilots are able to overcome it is wonderful, but still an insufficient level of safety as attested to by hundreds of fatalities. If it turns out that AoA sense system failures are the root cause of the MCAS behavior, then the AoA sensor system needs to be made more reliable (higher integrity), in keeping with potential catastrophic failures. What percentage do you think will choose store credit over refund?